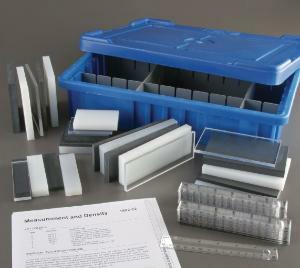 The applications for this versatile set of blocks extend into calculating and measuring volume, mass, density, and more. Five sets of five blocks are included. Each of the five identically shaped blocks are made from a different material — foam, polypropylene, pvc plastic, plexiglass, and HDPE plastic. Use the blocks in experiments to teach measuring techniques for two and three-dimensional objects, calculations using significant figures, measuring mass and volume of materials, calculating and measuring densities of objects of constant shape and/or constant materials, and more. Includes teacher and reproducible student instructions aligned with the national standards.